So we all know that Papua New Guinea is one of the most remote places on earth, where 'undiscovered' tribes still occasionally emerge from impenetrable rainforests. That is probably sufficient reason to explore a CD such as this. What you get is a set of magical recordings made in 1987 in five regions of Papua New Guinea. The music is predominantly vocal, songs - as the sleeve tells us - of hunting, war, totemistic ritual, cannibalism, myths, initiation, courtship, rain-making, funerals, magical healing, shark-catching and marathon feasting. Many are danced, accompanied by percussion instruments (the garamut slit drum, kundu hourglass-drum, launut friction drum, shell rattles), lengths of bamboo end blown to give a single pitch, and bamboo flutes. The rhythms can be forceful or trance-like, and are a mix of simple repetitions of regular patterns with more complex ideas. The vocalisation of songs, normally full-throated and open, and usually sung by groups in unison, is rich and vibrant. The recordings were made by John Thornley, who for many years was a senior producer of world music programmes for BBC Radio 3. They are impeccable. In this guise, as intrepid explorer, Thornley travelled in Papua New Guinea between August and October 1987, funded by a bursary from the Commonwealth Relations Trust. He lodged his recordings with the International Music Collection of the British Library's National Sound Archive (collection C838), and this album, part of the IMC series issued with Topic, samples the collection. The five regions represented are: Karkar Island, a volcanic island of copra plantations and fishing villages off the northern coast of New Guinea; the remote Green River, a tributary of the upper Sepik River in New Guinea proper, an area renowned for its legendary mosquitoes; the densely populated Wahgi Valley at Mount Hagen in the Western Highlands; New Ireland, the northeastern island first 'discovered' in 1516 by the Dutch; the Gazelle Peninsula to the East of the 500km-long New Britain. Each region has distinct and fascinating traditions. From Karkar island, we hear a dance sung by a mixed group from the characteristic sing-sing feasts, a drum call played by "big man bilong sing-sing" and a male song sung with drum accompaniment. Many of the songs from the Green River area are related to the production, preparation, and use of the sago palm (in pidgin, saksak); three are given here. There is also a warrior song, for this was an area that until recently had much inter-clan warfare and occasional cannibalism, and six healing songs. These latter include songs for women and children as well as a sung traditionally used to heal a man gored by an animal or injured in a battle. Four tracks give representative songs from Mount Hagen, an ubiquitous hunting song, a women's song using a traditional melody but recently-composed text, two love songs, and a sample of the sing-sing festival. A further track briefly samples the calls of local animals and birds (the cassowary, brown falcon, parrot, toucan, cockatoo, Bird of Paradise, and wild dingoes). Next, we move to New Ireland, where the harmonised first song, pur, links to the animal calls. This is a song sung as women prepare for dancing, with the words: 'High up on the topmost branches of the trees, the parrot sings its lovely song'. Other songs tell of sharks, death, and getting on a lorry. Each has harmonic elements, with male and female voices singing in different tessituras, one song (track 19) being accompanied by the haunting friction drum. This drum, which Thornley had been told was long obsolete, had once been played at the moment of death. It was used to represent in sound the spirit of the dead rising into the air, and here it neatly captures the sound: a high-tessitura resonance, the sound coming and going much as Mozart's glass harmonica, as the player rubs it with oiled vegetable fibres. Here, this beautiful sound is punctuated by the cries of a cockerel in the distance. It is New Ireland that provides tracks with the most variety on the album; following from this spiritual friction drum sound, a shark-calling song features shell rattles that gently vibrate as if rustling in the wind as the singer croons a virtual lullaby, juxtaposed with two vibrant slit-drum improvisations. Finally, two tracks recorded in Gaulim Village illustrate something of New Britain. The first is a song about Rongari, an evil witch dressed in a terrifying wooden mask, and the second is taken from the main ritual of the area, the fire dance. This last is the most extended track on the CD, lasting over nine minutes. Papua New Guinea is a place of contrasts. However, if you put this CD on as background music, you will probably be disappointed. On casual acquaintance, it sounds too straightforward to be interesting. Not so. 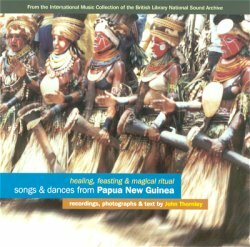 The real value of the CD emerges as you tie the booklet notes (24 pages of them) to the sounds, gradually building up a picture of the many different uses and functions of music in Papua New Guinean society. The selection of tracks, and how each is set against its neighbour, has been carefully thought through and managed. Listen carefully, referring to the notes, and a kaleidoscope of colourful treasures begins to emerge. Once familiar, you will find yourself picking out individual tracks with which to charm your friends. The only slightly unfortunate thing about this publication is that it has appeared around the same time as a much larger collection, Bosavi Rainforest Music from Papua New Guinea (Smithsonian Folkways SFWCD40487). This latter, a 3-CD set compiled by the ethnomusicologist Steve Feld, concentrates on a single people from the Southern Highlands. If you really want to be serious, you need the Smithsonian Folkways collection; but if you only want a sensible introduction to this magical world, the Healing, Feasting, and Magical Ritual CD has plenty to keep you happy.